Are your outdoor areas looking drab and unloved? Maybe you have a busy lifestyle (who doesn’t?) Don’t have time or energy for your garden at the end of the day because you want to put your feet up and relax? Have you considered using outdoor artificial plants as your ideal solution? Artificial plants, whether in or outdoors have been revolutionised. They look real, are hardy and most have inbuilt UV resistance. You can also buy a separate UV spray to protect your outdoor artificial plants from the harsh Australian sun. Apart from low maintenance one of the greatest benefits of adding faux plants to your home’s landscape design is their versatility. Because you don’t need to think about soil quality, positioning, and the grounds hydration, you have a great deal more freedom to create the design that fits your space the best. Have the flowers that you love blooming all year round. Our favourite is the Butterfly Orchid. 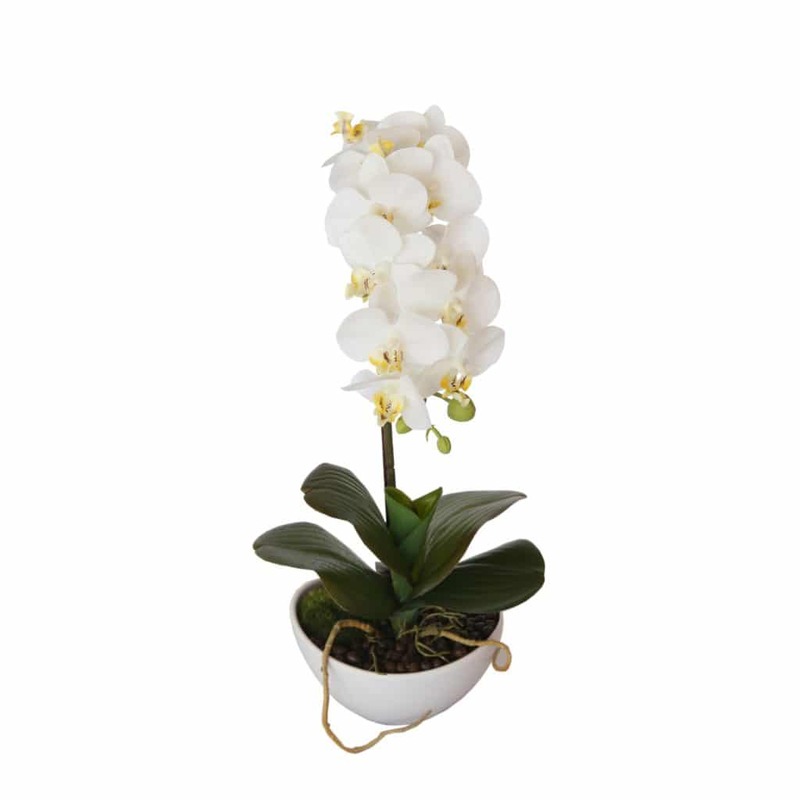 With the organic version notoriously difficult to grow, these artificial flowering plants add elegance to any home and look gorgeous every day. Other flowering plants like birds of paradise, purple perilla, hydrangea, flowering dracaena, wisteria, hanging roses will add depth and colour to your garden. Trees take years to grow. They look great for part of the year and are susceptible to damage from insects and disease. Let alone the seasonal changes with leaves falling in Autumn. 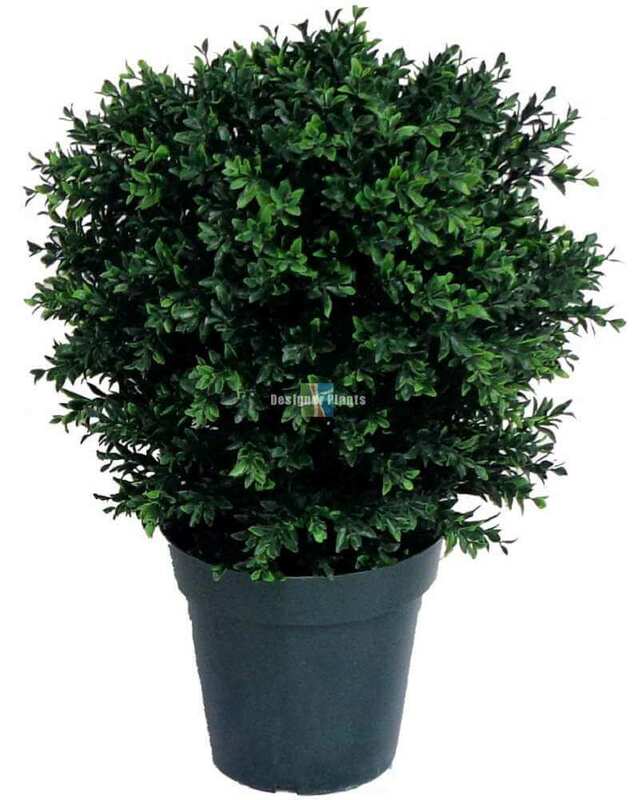 Add Bushy Ficus Trees to your space for an instant garden. Choose the height that you prefer, with trees that are 180cm helping provide convenient privacy regardless of whether they are on their own or planted in rows. Real Bamboo, even though it adds a great look to a garden, can be difficult long term with its propensity to spread and become invasive. It is also tricky to maintain. Instead, choose Japanese Bamboo outdoor artificial plants to your garden. They look magnificent without the traditional challenges that planting will bring. Try also adding fiddle fig, money plant, king philodendron, cyprus pine, ficus, and bayleaf trees depending on your landscaping plan. Planting bushy varieties is a great way to add another layer to your garden. Create instant hedges with artificial topiary shrubs (Hedyotis) or use flowering native, brown or fox tail grasses (that never need cutting) to highlight selected areas of your garden. Other small plants and bushes you can consider include birds nest ferns, yucca gloriosa, taro, mother in law tongue and agave plants to brighten up your outdoor space. Transform your outdoor areas into a tropical haven. Not all real palm trees will fit your climate, but with artificial palm trees, such as the Kentia Palm, you can feel like you are in the tropics every day. 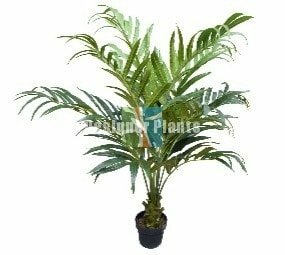 Choose from other types like areca, banana, fern, Hawaii tropical, mountain, and Phoenix palm trees to beautify your garden. Real plants are wonderful and provide many health benefits when they are planted in the ideal situation. The problem that life is often less than ideal, which is why outdoor artificial plants can step in and provide luscious greenery when efforts at growing the real thing have gone astray. Instant results: no waiting for your plants to grow, sometimes years, for the desired landscaping or privacy effect. Results are instantaneous and permanent. Change: move them around for a new arrangement when you get bored. It’s easy to create personal designs or even event-driven themes with artificial plants that are portable. Cost savings: with no maintenance you have no costs for water, fertiliser, replacement or help to maintain your spread. More time: to do the things that matter to you. Follow your passion or spend time with the family instead of weeding, watering and pruning your plants. Consistency: with the way they look. No seasonal changes to add that drab feel to your garden. Ensure greenery 12 months of the year without fuss.